No gps during voice call??? This sounds like crazy. I am in my car using google map and it works great. This sounds like crazy. I am in my car using google map and it works great. Then I make a phone call using the BT earpiece and suddenly google maps goes nuts, no gps signal. As soon as I hang up, hey I get gps again... It is really the voice call part. If I opt for a skype or WhatsApp call over IP in LTE, I have no issue with gps. The crazy thing is that sometimes I do not have the issue. Most of the time it fails, sometimes it works. I have the latest upgrade to Pie. I have not tried switching gps off and back on during the call to further debug this. Has anybody faced anything similar? Just tried Google Maps navigation, GPS Status and Voice Call at the same time - no problem! Well, I tried with BT and a whatsapp call and it worked great. So it really is the old fashion voice call. I have tried again today, I was in the car with my daughter and we both had GoogleMaps running and we made a voice call to each other. Her phone worked like a charm, mine had the "searching for GPS" message and failed... I used my Nokia 8 with Android Pie with the security update from Feb 1st. She used her Xiaomi Mi A2 with Android Pie from January 2019. We used the same operator "TRE H3G". Both phones have a Qualcomm chipset, mine is 835 and hers is a 630 or similar - the mid range one. I have also noticed that even without making a voice call from time to time the GPS Status shows 0 satellites fixed, if I switch localization services off then on again it immediately goes to 14+ satellites. Not sure if this is a failure in the app reading the data or the GPS device driver. I have also tried to RESET ALL APP PREFERENCES, as suggested in a similar thread for the Nokia 7 Plus phone. No improvement. I will probably do a factory reset of my phone. If it still fails, I will contact the official Nokia support. Forse the location service the device uses both GPS and network. With Oreo you can force the device to use only the GPS, with Pie you cannot. Maybe Maps prefers network assisted location, for this reason it loses the position when in call. With a voice call through WhatsApp the device remains connected to the LTE and Maps works fine. You have TIM in Italy, right? Tim supports VoLTE on our Nokia 8, activate the "Tim Voce 4G" option and reboot the phone, then try again. Take a look on the status bar if during a classic call the phone remains on 4G o switch to HSPA. This is exactly what I thought about in the first place. 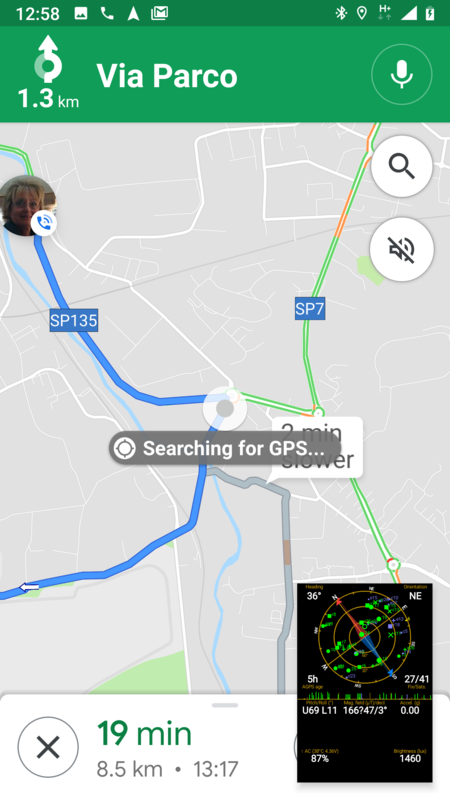 This is why I also tried with my daughter's Xiaomi phone with Android Pie and same operator but it was working for her while failing for me, we were in the same car using GoogleMaps and having a voice call ongoing. I have done more tests today. I forced 2G in my network preference and GoogleMaps worked just fine when I started a voice call. I was really puzzled because I thought that the problem was the switch from LTE to the voice circuit, which dropped the data connection and hence dropped the "A" in A-GPS. But no, it worked great. Then I tried immediately switching to 3G or LTE and in both cases it failed as soon as I started the voice call. So I tried one last option: I switched to FLIGHT MODE. And GoogleMaps worked perfectly. GPS Status reported some 14+ satellites fixed and I had no issue at all. I am converging towards maybe some junk/erroneous data being transmitted from the cell in voice call mode? So my last resort now is to install the Android ADB debugger tools and get a system trace of any debug messages while all this happens.